Here at The A.V. Club, we know what you really care about: killing people. And that’s why we’re devoting the next few days to the fourth-season finale of HBO’s Game Of Thrones. We didn’t plan it far enough in advance to call it a Week of Thrones, but we had a little more material than just a weekend’s worth. So behold: The Long Weekend Of Thrones, starting tomorrow, and running until Monday morning. Thursday: An Expert Witness interview with Game Of Thrones language creator David J. Peterson—the linguist behind Dothraki, Valyrian, and whatever raspy noises the White Walkers make. Come for the detailed breakdown of the linguistic history of Meereenese Valyrian; stay for the discussion of Grey Worm’s perfect accent. Friday: Sonia Saraiya has a For Our Consideration on that old standby: violence in Game Of Thrones. Why, exactly, is HBO’s show so graphic? And how does that help Thrones’ storytelling? Sunday: The long-awaited day arriveth. And you know what that means: Live chat. As Todd VanDerWerff and Erik Adams tackle the finale, “The Children,” the rest of The A.V. Club will be chatting up a storm, both in the live chat widget on our site and on Twitter at #avctv. And while you’re waiting for 9 p.m. Eastern to roll around, we’ll be re-promoting all of our Thrones content from this season, so you can appreciate all over again how smart we are while eating nachos. 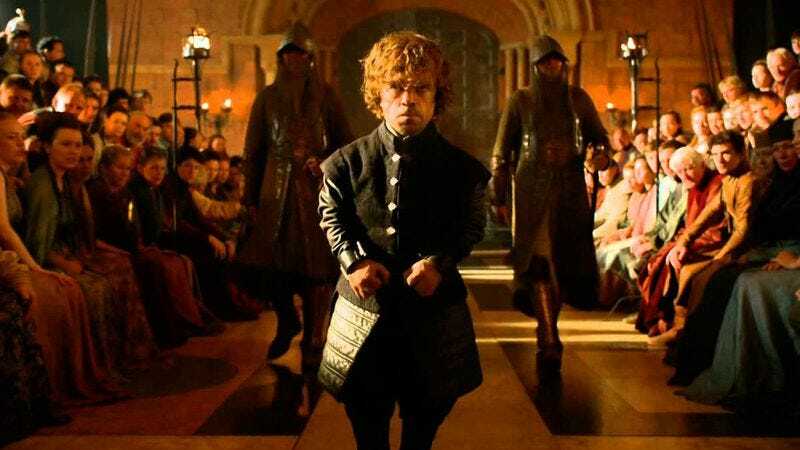 Monday: Because he doesn’t have anything better to do, Todd VanDerWerff serves up a For Our Consideration on the whole season—which has deliberately changed its storytelling style—in our brave new post-Red Wedding world. What’s Thrones’ game these days, anyway? Hopefully Todd knows. And that’s it! Enjoy the long weekend, because starting Monday there’s no more Game Of Thrones for a whole 10 months. We have to make the most of our murders while we can.